Hencam - shop - Buy chicken related t-shirts, tops, cups, mugs and stickers here! When you buy from Amazon.co.uk or Amazon.com, please use our link - it costs you nothing but supports hencam! Click an amazon link above to get started! If you need to get rid of Red Mite on your chickens, they can be very difficult to completely eradicate, but something like Poultry Shield can get rid of them completely as it is not a pesticide, but destroys the outer shell of the mite so it dries out and dies, which means the mites cannot become immune to it. The easiest (and free!) way you can help support hencam is by using this link the next time you buy from Amazon.co.uk or Amazon.com - it costs you nothing but supports hencam! How it works: Amazon pay us a small commission for every customer we refer to them who makes a purchase. The beauty is that you only have to use our link to amazon, then you shop and checkout as normal with amazon and don't pay a penny extra! t-shirt or a pillow or a bag today! The cafepress store is open for business! I've been hard at work taking pictures of the hens so they do actually feature on the products now. Help me make Tilly, Milly and Penny famous around the world! It's all at the lowest bargain prices and cafepress are pretty quick on their delivery times. 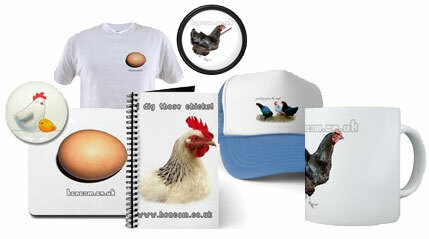 visit the hencam.co.uk store now! And also... if you want to buy or send the hens a treat, then I'm all for it! They would give you their undying love for a bunch of grapes so they aren't the hardest to please!